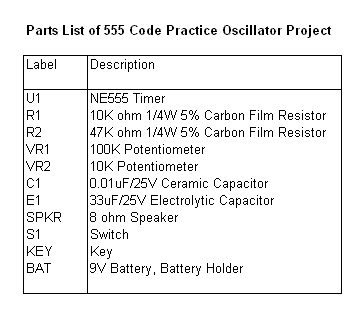 This code practice oscillator project uses a 555 timer IC which is one of the most fundamental IC available in the market today. 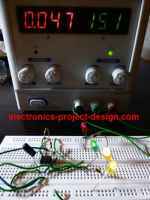 It is configured as an astable mode of which the output will oscillate once the 9V power supply is connected to the circuit. This is one of the various ways for amateur radio enthusiasts to practice the sending and receiving of Morse Code. Another method that is frequently used is the use of computer simulated software where the pressing of keys from the keyboard will generate a Morse Code signal. However, the hardware method is still a worthwhile constructional project that one can build. 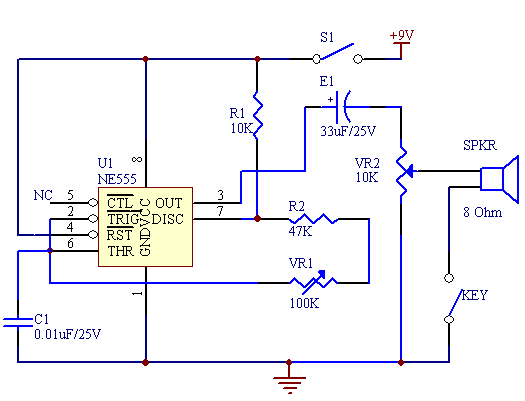 In this schematic, a 555 timer IC is used and configured as a timer in astable mode. Once triggered, it will generate a frequency from its output at pin 3. Once KEY is pressed, it will drive the 8 ohm loudspeaker which is connected in parallel to potentiometer VR2. The astable frequency of circuit U1 is given by the formula of 555 timer as shown below. The frequency of the sound can be adjusted by varying the resistor of potentiometer VR1. The volume of the speaker is adjusted by adjusting the potentiometer VR2 which is connected in parallel with the speaker and the key.